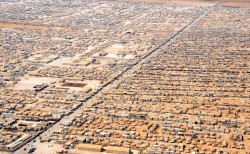 Refugees and Skilled Migration - How to Solve the Political Crisis? Around 500 participants ranging from politicians and policy makers to opinion leaders and experts from governments, international organizations, the private sector, and civil society organizations gathered recently at the Aula of Sciences in Vienna. The third Vienna Migration Conference 2018 aimed at solving the political crisis related to refugee protection and addressing European needs for skilled migration. Against the background of socio-economic developments and persisting economic imbalances the demand for migration will increase. Europe’s demand for skilled labour will grow and skills shortages will be felt more strongly in EU Member States. Non-European countries will need even greater support in creating economic opportunities for their young and growing populations. Both the EU and its partner countries have an interest in functioning policies that create regular channels for labour mobility, steer migration away from its irregular forms, and help put an end to the human tragedies that migration is currently associated with..
During Austria's EU Council Presidency, the name Gernot Blümel, the Federal Minister responsible not only for the EU but also for art, culture and media, will be mentioned time and again. 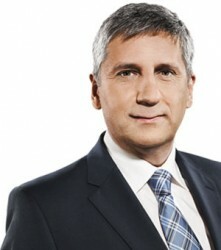 Blümel is also chairmen of the Vienna ÖVP and a close confidant of Chancellor Sebastian Kurz. His ministry is even physically integrated into the Federal Chancellery. With Malta and Turkey both joining Vienna based ICMPD in May, the International Centre for Migration Policy Development welcomes two new Member States. ICMPD has now 17 Member States all across Europe. In 2018 ICMPD is also celebrating the 25th anniversary of its founding and is looking into the future to try to see what it may hold in terms of migration and mobility of people. Former Austrian Vice-Chancellor and Minister Michael Spindelegger has been elected Director Genera of the Vienna-based International Centre for Migration Policy Development (ICMPD). 15 Member States of the Organization elected him for five years, ICMPD announced. Most recently, he was president of the Agency for the Modernization of Ukraine of the Ukrainian oligarchs Dimitri Firtash. Yesterday evening Reinhold Mitterlehner has been elected by the ÖVP board as new party chairman and vice chancellor. Spindelegger himself had left the party headquarters shortly before. 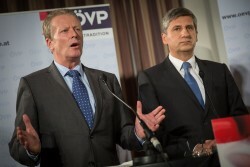 The decision in the ÖVP board was unanimous. He is supposed to lead the party out of the crisis. His first statement after the designation on Tuesday evening was: "We must close ranks." He now wants to discuss in which direction to proceed with the tax reform. A political decision will fall but only in the fall. Finance Minister Michael Spindelegger resigned today after eight months in office, the reason are differences within the People's Party (ÖVP) on debt reform and tax. He also stepped down as vice chancellor and head of the Austrian People's Party (ÖVP), the center-right junior partner of the grand coalition government. 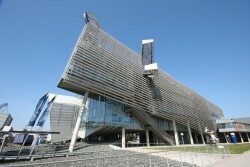 Austria: Hypo Group Investigation Committee to be Established? Will the Austrian government soon give in to establishing an investigation committee for problem bank Hypo Group? Huge losses by the sale of the SEE banking network could be expected. The downsizing of ailing bank Hypo Group Alpe Adria is a heavy burden for this year’s budget. 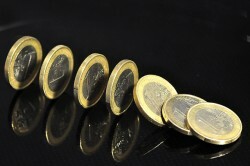 According to Finance Minister Spindelegger, the deficit comes at 2.7 percent of GDP while public debts will soar. The downsizing of problem bank Hypo Group Alpe Adria is a huge burden for this year’s budget. Austria: Is Spindelegger Suitable as Finance Minister? On Tuesday the Austrian Finance Minister will hold his first budget speech. Initial figures reveal record debt levels. Due to the capital injections into the distressed lender Hypo Group, Austria´s 2013 budget deficit will exceed the 3.0% threshold. 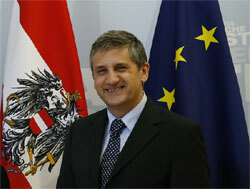 According to Finance Minister Spindelegger, Austria might face an excessive deficit procedure. The Austrian public debt burden will reach a new all-time high at the end of the current year. The challenging fiscal situation is partly attributable to the capital injections into Hypo Group Alpe Adria. According to managing director of Raiffeisenlandesbank Oberösterreich (RLB OÖ) Heinrich Schaller, the tax burden is too high in Austria. The bank is still threatening to leave for Germany if the bank levy will not be changed. 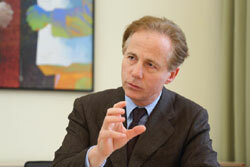 Deputy Chancellor and Finance Minister Michael Spindelegger considers the financial crisis not to be completely over. According to Werner Kogler, financial spokesman and deputy party leader of the Austrian Greens, the Hypo commission appointed by the government is an “intolerable escape attempt”. 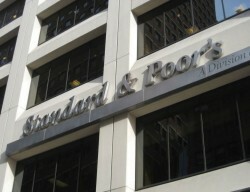 US rating agency Standard & Poor’s has confirmed the Austrian rating at “AA+” with a stable outlook. According to a decision in the petition committee, the online petition for the investigation of the nationlization of ailing Hypo Group Alpe Adria will be open for signing until the next committee meeting in June. Today the opposition will call for a joint request for a parliamentary investigation committee with regard to ailing bank Hypo Group. 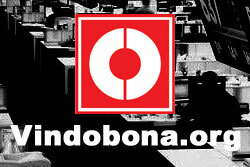 There will be no tax hikes in the near future concerning the inheritance of property within families. The draft law of the Finance Ministry also includes the exemption of business successions. The online petition for the establishing of a parliamentary investigation committee will not be stopped by the Austrian government, consisting of SPÖ (Social Democrats) and ÖVP (Austrian People’s Party). Herbert Walter becomes head of the nationalized Austrian Balkan lender Hypo Group Alpe Adria. According to Austrian Finance Minister Michael Spindelegger, Hypo Group needs even more capital injections. In a compulsory notification published on Friday morning, Hypo Group Alpe Adria has reported about an “acutely gaping capital hole” which has to be covered by the Austrian Federation. Detailed figures about how much the Austrian state will have to inject for the balance sheet total of 2013 will be published on Friday at the earliest. On Thursday the Austrian taxpayers are supposed to officially get to know the financial requirements for nationalized problem bank Hypo Group Alpe Adria. 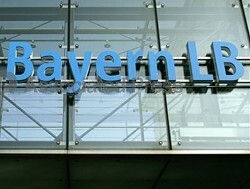 BayernLB: “We Were Brazenly Betrayed by Austria"
CEO of BayernLB Gerd Häusler claims the German bank and former parent company of nationalized Hypo Group Alpe Adria accuses Austria of having taken the law into its own hands. On Tuesday the Austrian government will explain the decided downsizing solution for the ailing bank Hypo Group Alpe Adria. Carinthia only wants to pay € 300m in downsizing costs. Finance Minister Michael Spindelegger announced wanting to include the federal province of Carinthia to participate in the downsizing costs for ailing bank Hypo Group Alpe Adria. Austerity measures are “inevitable”. In the dispute with BayernLB, former parent company of problem bank Hypo Group Alpe Adria, Finance Minister Michael Spindelegger calls for a tougher approach. Finance Minister Michael Spindelegger demands valid figures from Hypo Group Alpe Adria before any further capital injections will be made by the Austrian state. The government has finally made a decision. Ailing Hypo Group Alpe Adria will be downsized through a private bad bank. Today the supervisory board of ailing Hypo Group is gathering to determine the financial gap of Hypo Group and the amount required to complete the balance sheets for 2013. Moreover, a decision about the SEE network will have to be made. Austria: Who Will Pay for Hypo Group? 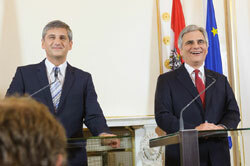 In the dispute around who is to pay for problem bank Hypo Group Alpe Adria Chancellor Werner Faymann intends to negotiate with the Austrian provinces about a contribution to the bank levy. Hypo Group: Insolvency Still an Option? The group of international advisors appointed by the Austrian government seems to have come to a different conclusion than the task force of Hypo Group Alpe Adria. Hypo Group Alpe Adria is expected to reveal losses of around € 2bn in the balance sheet for the business year 2013. Up to now, losses in the amount of € 1.3bn were expected. The final report by the task force of problem bank Hypo Group Alpe Adria calls upon the Austrian government to make a decision about the downsizing until mid-March.